During the course of evolution through various endosymbiotic processes, diverse photosynthetic eukaryotes acquired blue light (BL) responses that do not use photosynthetic pathways. Photosynthetic stramenopiles, which have red algae-derived chloroplasts through secondary symbiosis, are principal primary producers in aquatic environments, and play important roles in ecosystems and aquaculture. 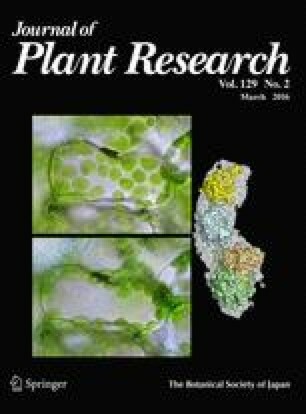 Through secondary symbiosis, these taxa acquired BL responses, such as phototropism, chloroplast photo-relocation movement, and photomorphogenesis similar to those which green plants acquired through primary symbiosis. Photosynthetic stramenopile BL receptors were undefined until the discovery in 2007, of a new type of BL receptor, the aureochrome (AUREO), from the photosynthetic stramenopile alga, Vaucheria. AUREO has a bZIP domain and a LOV domain, and thus BL-responsive transcription factor. AUREO orthologs are only conserved in photosynthetic stramenopiles, such as brown algae, diatoms, and red tide algae. Here, a brief review is presented of the role of AUREOs as photoreceptors for these diverse BL responses and their biochemical properties in photosynthetic stramenopiles. This work was supported by PRESTO Japan Science and Technology Corporation and a grant-in-aid for scientific research (26440156), from the Ministry of Education, Culture, Sports, Science and Technology, Japan. I thank Dr. Ian G. Gleadall (Tohoku University) for critical reading of the manuscript. I am grateful to Dr. Hironao Kataoka (Tohoku University) and Dr. Masahiro Kasahara (Ritsumeikan University) for helpful comments and discussion.